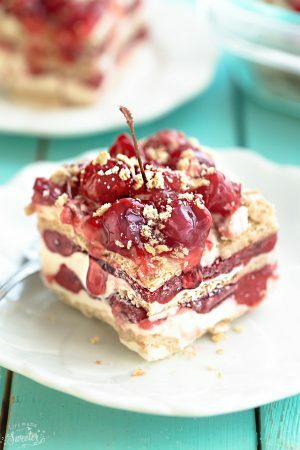 Strawberry Icebox Cake + Recipe VIDEO! 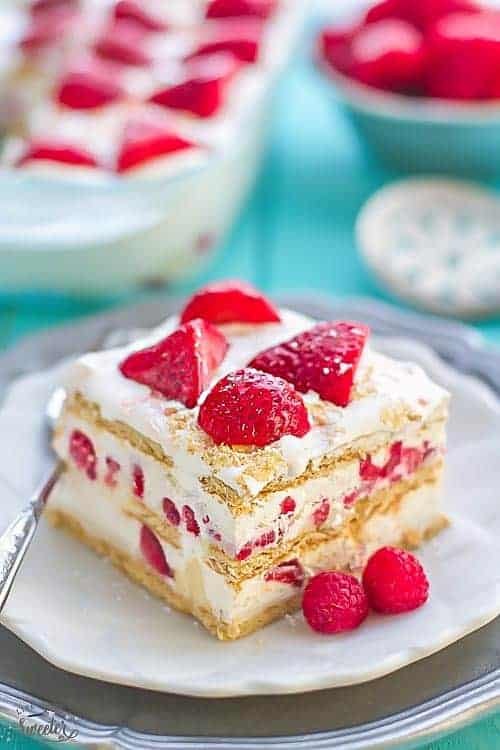 Strawberry Icebox Cake – the perfect easy NO BAKE dessert for summer. Best of all, this strawberry shortcake inspired recipe has only 5 ingredients with a video. A hit at potlucks & BBQ’s. 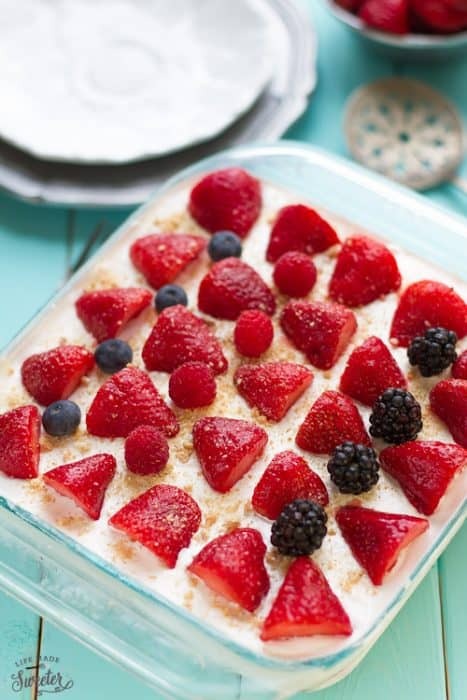 With cheesecake pudding (or cream cheese), whipped cream, graham crackers & strawberries. Pin for later AND follow my Recipes Board on Pinterest for more drool-worthy treats! 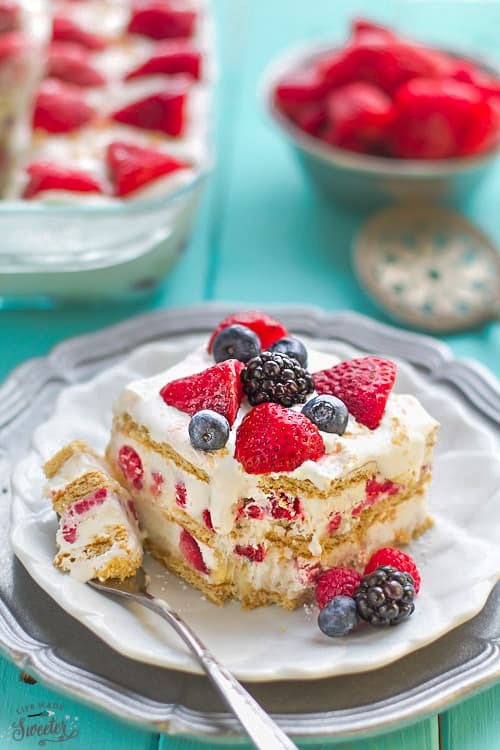 Once summer is in full swing, this No Bake Strawberry Icebox Cake shows up a lot at our house. Our weekends are usually busy visiting family and friends and they all love whenever we show up with this cool and creamy dessert. 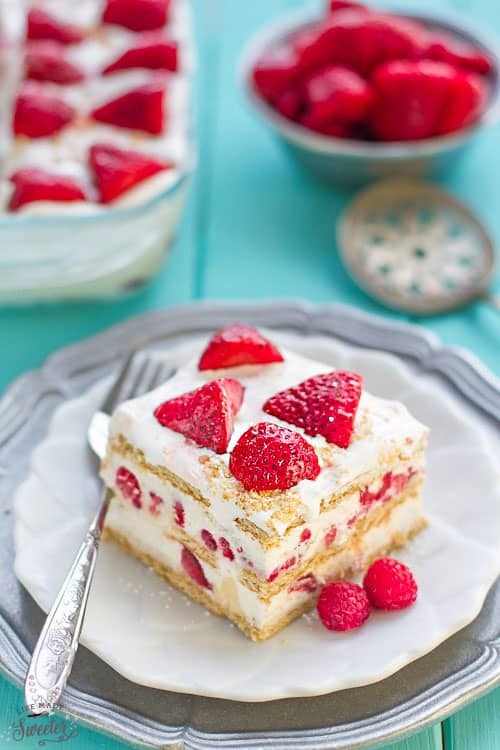 It reminds me of the classic Strawberry Shortcake with a creamy cheesecake filling. I have a few other versions of this popular cake that we make often. They are super EASY to whip up and ridiculously simple to customize. 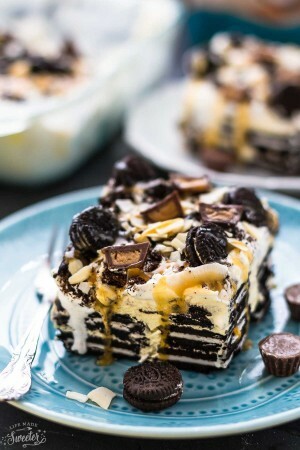 They are my go-to no bake desserts once the weather gets warmer. Especially when you’ve got last-minute company or if you have to bring a sweet treat to a barbecue on short notice. Plus, they taste amazing and are the best to make on a hot day when you just don’t feel like turning on the oven. 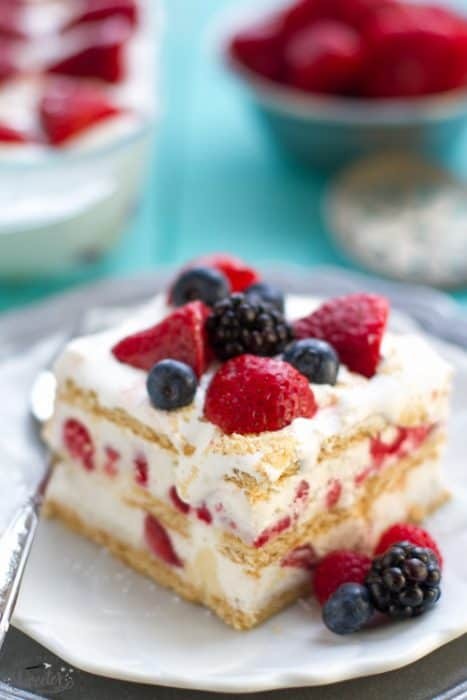 Graham crackers that soften into an airy cake-like texture as it rests in the fridge in a pan. 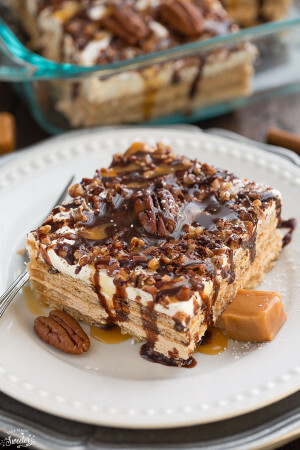 Another great thing about these no bake cakes? Swap in your favorite mix of chopped nuts, a drizzle of chocolate or whatever you have on hand! Or add in some fresh mix of triple berries like I did here with my No Bake Mixed Berry version. Bring one along to any summer potluck or barbecue and it’s guaranteed to be a hit with never any leftovers. 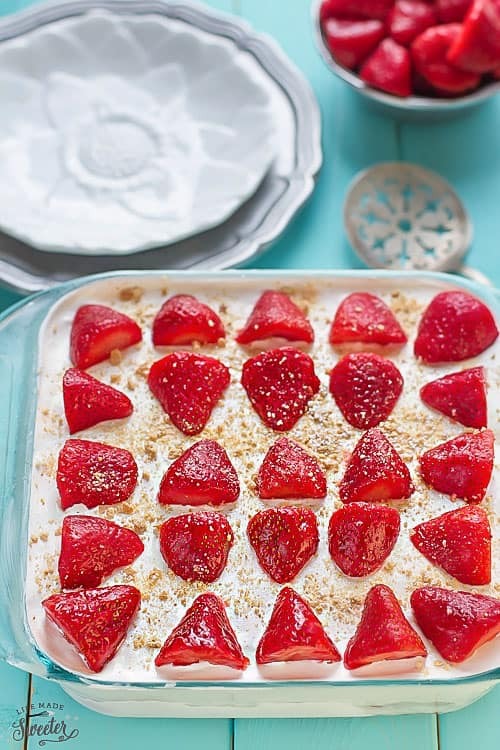 Strawberry Icebox Cake only requires 6 ingredients - cheesecake pudding, whipped cream, graham crackers, and fresh strawberries. Great for making ahead for summer parties, potlucks and barbecues! To make freshly whipped cream: With a hand mixer or in the bowl of a stand mixer, whip 2 cups of heavy cream until it just holds soft peaks. Add 1/3 cup of powdered sugar, 1/2 teaspoon of vanilla extract and whip to combine until stiff peaks hold. Do not overmix. Set aside 1/2 cup whipped cream for topping. In a separate large bowl, make the pudding according to package directions using the 2 cups of cold milk. Allow 5 minutes to thicken. Once thickened, fold in the 3 cups of whipped cream. Assemble the cake: Spread a thin layer of the cream mixture in a 8 x 8 pan to coat the bottom. Place 3 graham crackers across the center of pan and then break up 1 or 2 more crackers as needed to fill in the gaps. Spread half of the cream mixture on top. Place a single layer of sliced strawberries. 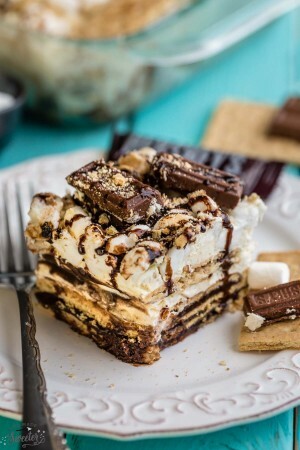 Top with another layer of graham crackers, breaking them as needed to make them fit. Spread the remaining cream mixture over top. Add another layer of strawberries. Top with the final layer of graham crackers. Spread the reserved 1/2 cup freshly whipped cream (or Cool Whip) over evenly. 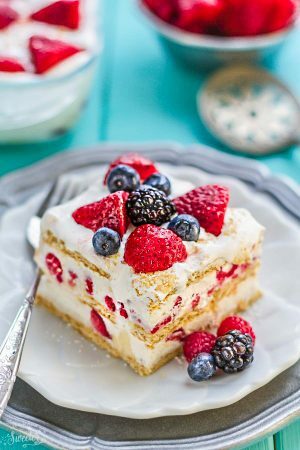 Place the last layer of the prettiest berries reserved for the top. Sprinkle on graham cracker crumbs on top. 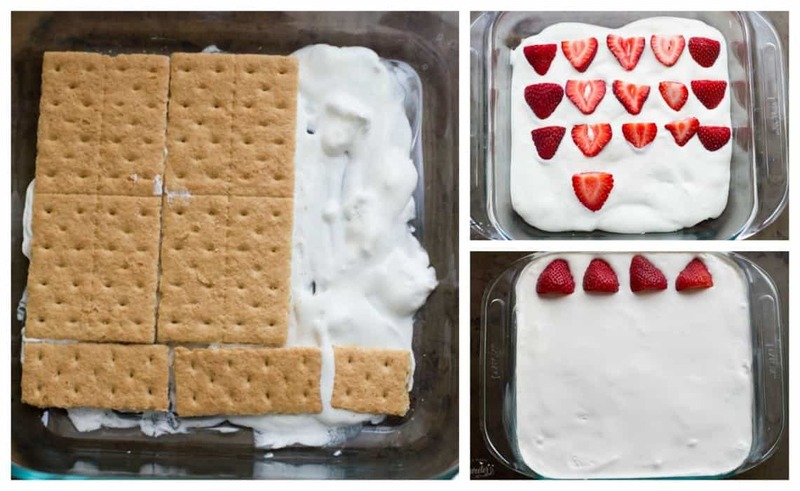 Refrigerate for at least 4 hours or overnight until the graham crackers have softened completely. Serve chilled and dust with powdered sugar if desired. 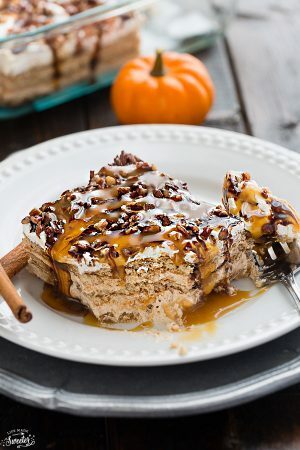 **You can replace the cheesecake pudding with homemade or storebought vanilla pudding or even softened cream cheese and leave out the milk used to make the pudding. Just mix in with the 3 cups of whipped cream.